Although my mother came from a Chabad family, my father did not. He had come from a Polish background and his Polish passport meant that, after the war, my parents were able to get into the American section of Berlin, and that is where I was born – in the Eschwege displaced persons camp – becoming a bit famous as the first baby to be circumcised there. After we immigrated to the United States, ultimately settling in the Crown Heights section of Brooklyn, I was enrolled in the elementary school of Yeshiva Rabbi Chaim Berlin. During this time, like many of my classmates, I did not have an affinity for the rabbis in my life who all spoke English with a heavy accent, for I found it hard to identify with them. So it was a surprise when I met the Rebbe in 1955, and he spoke English fluently. My mother arranged that audience for her and me, and I recall that his English was very proper. I was nine years old at the time, and he tried to engage me, asking me if I wore tzitzit, the ritual fringes. (In my yeshivah, we weren’t taught to wear our tzitzit out so they could be seen.) When I said yes, he asked me how many strings there were in my tzitzit. I said that I didn’t know because I had never counted them. “Yes, I do,” I answered. He spoke to me in a kind way without talking down to me and because of that I heard him, but his words did not penetrate my heart until much later. At that time, my world revolved around television, the Brooklyn Dodgers and my friends. In my world, the Torah and its mitzvot were not front and center; Judaism was secondary. Yes, I attended a yeshivah, but I found little inspiration or warmth there. The Rebbe was the first rabbi whom I found to be warm and accepting. And that made a big difference. Even though nothing changed for me immediately, I was left to wonder about this unusual man – why people wanted to adhere to him more than to any other rabbi whom I’d studied with, including my teacher Rabbi Zaidel Epstein who was a genius and exceptionally pious. Fast forward to 1964. I was attending Brooklyn College at night, but on Purim, I cut school and, together with another classmate, decided to see what Chabad was doing for the holiday. At the Chabad farbrengen what impressed me the most was the Rebbe. He walked in with eyes blazing – they were almost on fire – and he proceeded forward with determination. I had never before seen such dynamic movement in my Torah teachers. And I understood at that moment that this dynamism is the way of Torah. It made an incredible impression on me. I had imagined that all Jewish holy men were constantly bent over, studying the Talmud all day, and I didn’t want to be like them. I didn’t want to become a hunchback. But the Rebbe demonstrated, with his dynamic persona, that it didn’t have to be that way. I understood that the Torah wanted us to be humble while being powerful. A short while later I took leave of absence from college, forgoing my state scholarship, intending to learn for a year in Israel, though not in a Lubavitch yeshivah. But G-d had other plans. It turned out that the yeshivah that accepted me had no beds available in the dormitory, so I decided that the Lubavitch yeshivah in Kfar Chabad – where my mother’s family resided and where I had living accommodations – made sense. At first, I was only going to stay for six weeks, but the friendliness of the boys and the inspiring chasidic ideology has kept me there for almost 55 years! During my stay in the Lubavitch yeshivah, I was a very serious student, and I deeply internalized the chasidic teachings concerning iskafya (meaning, “restraint”). We were taught that we had to break our ego attachments, which I understood to mean in everything – whether food or clothing – whatever attached us to the physical world. We were not to care about our physical condition or anything that brought us pleasure. I did my best to practice iskafya, but I constantly felt guilty that I wasn’t doing it to the degree that I should. And I was also bothered since all the chasidim around me were happy people who loved life, yet I was miserable. I wrote to the Rebbe about my dilemma, and I had an opportunity to discuss this issue with him in a private audience on the occasion of my twenty-third birthday in 1969. That is when the Rebbe explained to me that I had got it all wrong. The Rebbe clarified that iskafya is not an exercise of self-denial, nor does it require excessive fasting, or hurting myself, or belittling myself. Rather, it was a matter of not indulging in things that are unnecessary. He went on to emphasize that by simply following the Torah and its mitzvot, I could reach the highest spiritual levels without going to extremes. All I had to do was focus on my study of Torah and chasidic teachings, and on prayer and meditation. He also stressed that a Jew who takes care of his hygiene, whose clothes are clean and properly fitted, is presenting Judaism to the world in a way that sanctifies the name of G-d. But if he does the opposite – if he is dirty or sloppy – he is desecrating the name of G-d, especially if he is a Torah scholar. Because of my misunderstanding, it had appeared to me that self-nullification was the ultimate goal and, without it, the Torah and its mitzvot were ineffective in accomplishing their desired effect. But the Rebbe taught me that iskafya is only a tool of divine service and should never take the place of Torah study and mitzvah observance. I have shared this insight with many of my students over the years, for I believe that it put me on a correct path and actually saved my spiritual life. 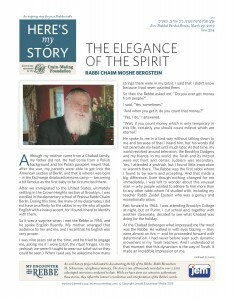 Since 1977, Rabbi Chaim Moshe Bergstein has served as the director of Chabad of Farmington Hills, Michigan. He was interviewed in July of 2018. "My Encounter with the Rebbe" is an oral history project geared at documenting the story of the Lubavitcher Rebbe, Rabbi Menachem M. Schneerson, of blessed memory’s, life. So far, we have interviewed over 1,400 people in over five different languages. Every interview is funded by viewers like you. To fund an interview or to join in the dollar-per-interview campaign, please click above. "עשי כפי שיורה לך סבא שלך"
"הוי מקבל את כל האדם בסבר פנים יפות"
"ולאות ולמופת. . . יהיה לו החלום"
"עד כמה זה חשוב עבורך"
"כשילד יהודי מבקש, צריך לתת לו"
"הם כן שומרי תורה ומצות"
"...יכלתם לחסוך את זה לגמרי"
Can You Land This Plane? "He Thinks I Don't Know"
"A smile that lit up the world"
"A Needle In A Haystack"
Directions From A "Simple Jew"
"Go ahead with the procedure"
"It should be better and better"
"I want you to smile"
"Weren't you angry about the letter?" "How is the young couple?" "We just called him "Monsieur"
"I give you my guarantee"
"Nine and a half should be ten"
"Out of conviction and with love!" "He will always choose G-d"
"Greet every human being with a kind face"
"I meant so much to him"
"Send a telegram to my father-in-law"
"When was the baby born?" "This is how I feel your pain"
Be There At 6 A.M.